Infinite Space begins with a familiar enough RPG scenario: youthful protagonist Yuri (are protagonists in JRPGs ever anything but youthful? ), trapped on an oppressive planet and dreaming of life as a space traveller, is whisked from his tedious existence by Nia Lochlain, a kind of female Han Solo analogue with a sassy attitude and a typically pneumatic physique. If Infinite Space's opening plot developments feel worryingly like Star Wars, the game rapidly morphs into pure space opera, as Yuri takes command of his own ship, fights intergalactic space pirates and strives to reclaim the Epitaph, a mysterious object given by his erstwhile father. From here, Infinite Space gradually opens up into a game that is surprisingly grand in scope, offering up a vast network of planets to visit, hundreds of characters to meet and an armada of ships from which to choose. 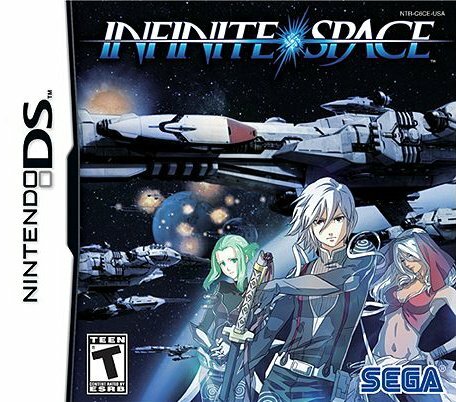 What is immediately clear is that Infinite Space isn't a typical RPG, but is in fact split into several discrete but intrinsically linked play elements: character interactions are, in a pleasingly old-school manner, text-based, with static graphics illustrating each character, while visiting planets – where you can hire new crew members, purchase blueprints, build ships or visit a tavern, depending on your location – are entirely icon-based. 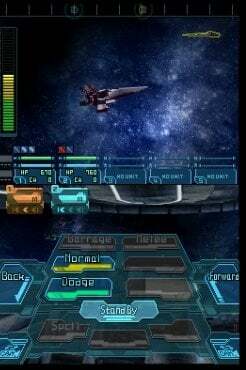 During space combat, meanwhile, Infinite Space brings out the big guns – both literally and figuratively – with battles displayed in impressive polygon-based 3D. As combat features so heavily in Infinite Space, a mechanically satisfying battle system is vital to ward off the dreaded grind, and while the game's real-time battles initially appear a little one-dimensional and shallow, further investigation reveals hidden depths. When making contact with enemy ships – either in predefined moments in the plot, or during a randomly generated skirmish – you're presented with an exterior view of the battle on the top screen, while your commands are issued on the screen below. One of the key elements on this lower screen is the command gauge, which decreases with each order issued, but will replenish given a few moments to recharge. This makes these encounters a tense game of cat-and-mouse, with both sides constantly trying to anticipate the other's next move while flying in an out of firing range to allow their command bar to fill back up – mistime an attack, dodge, or manoeuvre, and you're a sitting duck for your enemy's laser fire. While the first few hours are limited to three types of order (dodge, plus normal or barrage fire) which counter one another much like an interstellar form of Rock, Paper, Scissors, more are added as you progress through the game; later, you can opt to release a wave of fighter aircraft, unleash a salvo of anti-air fire, issue a special order (increasing some of your stats for a brief period) or move in close for a hand-to-hand melee attack. It's a combat system that takes a few attempts to get to grips with – particularly when faced with one especially tough opponent early on – but once mastered proves to be both intuitive and satisfying. At the same time, navigating through Infinite Space's vast network of planets couldn't be simpler: you can plot your course via each star system's shipping lanes with taps of the stylus, while pressing the directional pad zooms your view in and out of the neatly designed 3D map. Void gates provide access to other star systems, with new ones continuously unlocked as the story unfolds. It's an elegant and intuitive system, and one which works perfectly with the DS's touch screen controls. Similarly, remodelling your fleet of ships – a core ingredient of Infinite Space's gameplay – is a pleasure thanks to clearly laid-out menu system, which allows you to purchase and fit new components to your craft by dragging them around in modular, Tetris-like blocks. These modules include weaponry, cabins for your crew, fire control rooms and shields, and your selections – and how carefully you use the available space in any given ship – will have a tangible effect on how your ship behaves in combat. Plenty of big guns and shields will provide you with a craft strong on attack and defence but low on speed, for example, while keeping cabin room high will give you plenty of manpower during hand-to-hand melee attacks. But while Infinite Space deserves praise for the effectiveness of its menu and combat systems, there is one glaring fault: in a game as often bewilderingly large in scope as this, it's easy to lose your place in the sprawling narrative. Fail to pay attention to a few lines of dialogue, or simply forget where you were up to in the game when you played it last, and you can find yourself wandering from planet to planet for hours at a time in the attempt to pick up the plot where you left off. It could be the years getting the better of us, but we found keeping a notepad and pen handy to jot down planet names and story details – surely a sign that a mission log of some sort is sorely missing. Nevertheless it's pleasing on a handheld that is full to bursting with pet simulators, instantly forgettable movie tie-ins and puzzle games, to see a title as ambitious and unapologetically niche as Infinite Space. And if some of the game's niggling problems are down to DS's technical limitations – certain graphics are repeated many, many times, and you'll become extremely familiar with the handful of speech samples reeled out during combat – the comparative ease of its icon based control system makes it perfectly suited to the stylus-based format. The story, despite its overly familiar elements, also grows in richness and detail as the hours notch up, with a plethora of engaging crew members to recruit and a plot that isn't afraid to throw in the odd surprise here and there – an unexpected bit of eye damage providing a decidedly memorable moment a few hours in. Despite its flaws, Infinite Space will provide many, many hours of epic entertainment for anyone with the patience to plumb its greater depths. 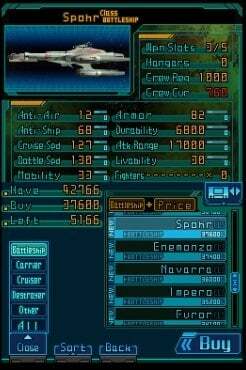 While the combat is compelling and tense enough to justify the frequent encounters throughout the story, it's the rich, detailed ship buying and modifying component that provides the most satisfying part of the game, and fooling around with the dozens of weapon and module combinations will provide hours of entertainment by itself. Just don't forget to keep a pen and paper handy. Glad you reviewed it. The combat is REALLY tricky, it takes some serious brainpower and a bit of luck as well. But espeically on the XL screens, the game looks great. A different RPG, of that there is no doubt. Yet another good score for the game! @SpoonyBard: Might I recommend getting a DSi (or even XL if you like). This will be one of first games I will buy for my 3DS. Great Review Man. I went to get this awoke back but they didn't have it in stock. Looking forward to playing this one, as I build ships for a living. "Nevertheless it's pleasing on a handheld that is full to bursting with pet simulators, instantly forgettable movie tie-ins and puzzle games, to see a title as ambitious and unapologetically niche as Infinite Space"
Brilliant review. This is a really challenging game, but incredibly rewarding. People don't realise there are games of this depth on the DS. I might get it when it gets cheap. It looks and sounds disappointing to me, but then again, I wasn't quite sure what it was really supposed to be until it came out. I was expecting something more along the lines of Homeworld, Star Flight, or the ship sections in Nostalgia. Not...this. Despite the depth, this doesn't really sound like it would appeal to my tastes. I've got this in the mail, hope my brain does't explode! Great review. I have been playing since day one waiting for a review. Have to agree about the mission log but never spent to long finding where to go next. The story grows on you after a while and hopeing the next planet will give the blueprint for a better ship was alway fun. Long game pick this up for weeks of fun! Ryan mate, you got me with "...a kind of female Han Solo analogue with a sassy attitude and a typically pneumatic physique". There should be a rule saying every sci-fi game/ movie should have one character of that ilk. lol. So all in all the strategy us what pulls this game ahead of the competition? @EdEN - for the first few hours there is some luck involved, but when I started moving my ship out of range while waiting for the command gauge to fill that helped a little. It won't help if your hit points run too low during a boss battle. 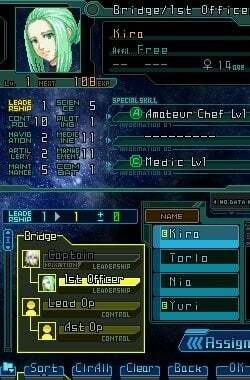 There's also the tasks regarding customizing your ship using Tetris-shaped modules to fill in the spaces, installing more sensible weapons, and fulfilling requirements to recruit more members a la Suikoden. And though the dialogue during battles is repetitive, at least there's dialogue. Ship versus ship battles are entertaining but the interface IS lacking. All in all it's a good game that was luckily in stock at the Nintendo World Store in New York (I visited the place for the first time last month). A decent game and one that I'll be playing this weekend while watching TV. Definitely a collector's item. I've been wanting to play this since the JPN release. But reading all the mixed reviews sort of makes me apprehensive. Heh, I happened to find a line in a different review that sums up my disappointment perfectly: "This starship sim never reaches escape velocity from the cloying traditions of Japanese RPGs." Got a 90% from ONM, but other reviews have pointed out the flaws you have. I think a high 8 sounds about right. Not for me, but sounds like an immense game. Awesome, I might get this game too after getting Dragon Quest IX. hmmm, this seems like a extremely interesting game, and if i can find it, I will write an extensive review of it. this and Solatorobo: Red the Hunter, Suikoden DS, Avalon Code, Phantasy Star 0 and Golden Sun: Dark Dawn seem like ones to look out for. Or go to Coolrom.com and get them for the DesMumE DS Emulator on PC. works great and is free! A well-made animé-esque space opera action JRPG with interesting customization elements?! Heck, yes! How have I never heard of this before?! It was worth going back through the DS archive just to find this hidden gem. Struggling over this game. Have you given it a try? How is it? @Andrzej777 No, I haven't been able to get it yet.